Apparently there's a market for a 5 Series stretched to the length of a 7 Series. Built specifically for the Chinese market, which seemingly laps up anything that’s been stretched a few centimeters, the new long-wheelbase BMW Series Li is set to make its debut at next week’s Auto Shanghai. A selection of images have leaked online, providing a glimpse into the stretched 5er’s styling. 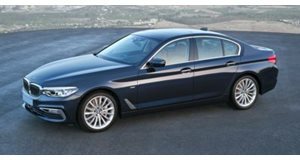 With a wheelbase that’s been lengthened by 133mm, the 5 Series Li will stand at 5,069 mm in length, or just 29 mm less than the standard 7 Series. Which immediately begs the question: what the hell is the point of this car? We will put that question to BMW and its Chinese partner carmaker, Brilliance, next week in China. In the meantime, you’ll be interested to discover that the new model is around 130 kg lighter than the car it replaces with enhanced aerodynamics, weighing in at 1,610 kg. This, despite the fact it gets better soundproofing, electrically-adjustable comfort seats, a panoramic glass roof and a touchscreen slotted into the armrest between the rear seats. Power will come from a choice of two 2.0-liter four-cylinder gasoline engines and a 3.0-liter six-cylinder unit, ranging from 204 to 306 horsepower.